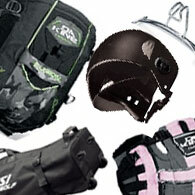 We carry a complete line of kitesurfing accessories for everyone at all levels. We have been a retailer for Dakine, NSI, and many other kitesurfing product manufacturers for many years. We've had great success with Dakine's harnesses incorporating superior lumbo/sacral support as well as a fantastic range of kitesurf travel bags, and other surf/kite/snow related products. Call us for details and availability on any DaKine, NSI, or any other kitesurfing products!